Alexander Thomas Brown was born in Bristol on 17th May 1979. His journey in rugby union began at the tender age of 6 for the Clifton RFC minis section, where he spent his formative years working his way through the clubs various age levels. During this period he attended the famous Colston’s School, winning the 1995/1996 Daily Mail School’s Cup whilst in the sixth-form. Fast developing as a mobile second-row and skilful exponent of the lineout, Brown was brought to Bath’s attention by the club’s former international flanker Andy Robinson in 1998, who was head of sport at Colston’s School at the time. Unfortunately, what appeared to be his big break in club rugby came just as the game turned professional in England. Consequently, there wasn’t yet an established academy setup at The Rec, meaning the fledgling forward was starved of meaningful game time. Keen to nurture Brown’s obvious talents and prevent him stagnating at Bath, Robinson contacted Pontypool director Eddie Jones, with a view to him kick-starting his career in South Wales. Having secured an 18-month contract at Pontypool Park in 1999 he was finally able to cut his teeth in senior rugby, an education he described as “an eye-opener”. This invaluable experience across the border helped him to follow in his father’s footsteps by securing a move to his home town club. The switch paid immediate dividends with Brown pivotal in helping Bristol win the inaugural U21 Zurich Premiership title. Under the tutelage of player coach and fellow second row Dean Ryan, he was voted the club’s 2000/2001 player of the season. During his four years at The Memorial Ground, Brown experienced the high of qualifying for the Heineken Cup and the low of being relegated from the Premiership in his final season at the club. Brown’s growing reputation down the M5 had attracted the attention of Bristol’s West County rivals Gloucester, where Dean Ryan was now assistant coach. 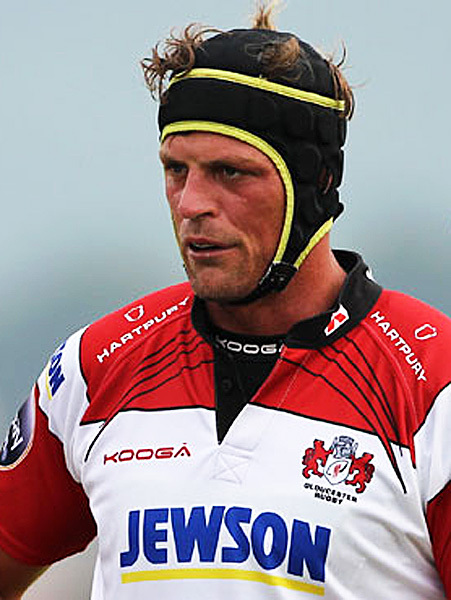 He signed for the Cherry and Whites in the summer of 2003, allowing him to continue to ply his trade in the top flight. The move coincided with his selection to represent England Saxons in the inaugural Churchill Cup in Canada, which the nation’s development side went on to win. He made his 1st XV Premiership debut against Rotherham on 13 December that same year, which was to be the start of long and fruitful career at Kingsholm, both on and off the pitch. Brown made an immediate impression at his new club, topping the 2003/2004 Premiership lineout statistics and being named Gloucester players’ player of the season. A string of impressive displays over the next two seasons meant Brown was now firmly back on his old mentor Andy Robinson’s radar, who by now had risen to the heady heights of England head coach. Robinson initially included him in a 40-man training squad in October 2004, before selecting him in the full squad for the 2005 autumn international series, only for fate to deal him a cruel blow. Brown was widely expected to make his England debut against Australia in the November, but suffered a neck injury and was ruled out of the entire autumn programme. Thankfully the 2005/2006 season ended on a much happier note for Brown who, having recovered from his injury, finally got his hands on his first piece of silverware with Gloucester. It came after a dramatic 36-34 extra-time victory over London Irish in the 2006 European Challenge Cup final at The Stoop. Good things come to those who wait, which for Brown meant finally making his England debut after being selected on the summer tour to Australia, starting in the 34-3 first test defeat in Sydney. Having helped Gloucester to top the league table at the end of the following season, Brown was part of the 44-16 playoff final defeat to Leicester Tigers at Twickenham, as a first Premiership title once again agonisingly slipped from the club’s grasp. Another successful domestic campaign, in which he picked up the Gillette Power Award, meant another summer tour. This time the England squad jetted off to South Africa where Brown started both tests – a 58-10 defeat in Bloemfontein and a 55-22 defeat in Pretoria. An injury-plagued 2007/2008 season ended on a more positive note when Brown signed a three-year contract extension to keep him at Kingsholm until 2011, deserved reward for one of the most consistent performers in the Premiership. This next chapter in his Gloucester career was defined by a run of three consecutive Anglo-Welsh Cup finals. Brown started all three games, with mixed fortunes: a 50-12 thrashing by the Cardiff Blues at Twickenham in 2009 was followed by a 30-24 loss to Northampton at Sixways in 2010, before the club finally got their hands on the trophy for the first time since 2003, after beating Newcastle 34-7 at Franklin’s Garden in the 2011 final. Brown had already signed a new two-year extension to his contract in January 2011 after clocking up his 200th Premiership appearance, despite receiving what he described as some “cracking offers” from elsewhere. However, a long and illustrious playing career that had spanned over 14 seasons in the upper echelons of the game was tragically brought to a premature conclusion during the final season – his testimonial season – of his contract. Brown, who by now was 33-years of age, seriously injured his shoulder in the first game of the campaign against Northampton. After almost three-months of rest and rehabilitation, he underwent complex surgery on nerve damage in the hope that he would be able to make a comeback. Unfortunately, the writing was on the wall and he was forced to accept that he had pulled on the famous Cherry and White jersey for the last time, after 10 seasons at Gloucester. His hugely successful spell at Kingsholm included 227 Premiership appearances, a record 87 consecutive starts and a total of 40 points. Ironically, prior to his unforeseen retirement Brown had been supporting Restart – the Rugby Players’ charity – to help other players who have suffered serious injury and illness. Now the shoe was on the other foot he began helping out the then head coach Nigel Davies to co-ordinate the lineout – an area he is well versed in. Keen to retain his wealth of knowledge and experience, together with his ingrained understanding of the Gloucester ethos, the club appointed him as Rugby Operations Manager in April 2013. You are absolutely right, Stuart – we got our Nigels in a twist. Have changed it now to Nigel Davies. Great article but the last paragraph states Alex started out as line out coach under Nigel Melville? That can’t be right.